It’s almost spring, and we’re so ready for the change in season! 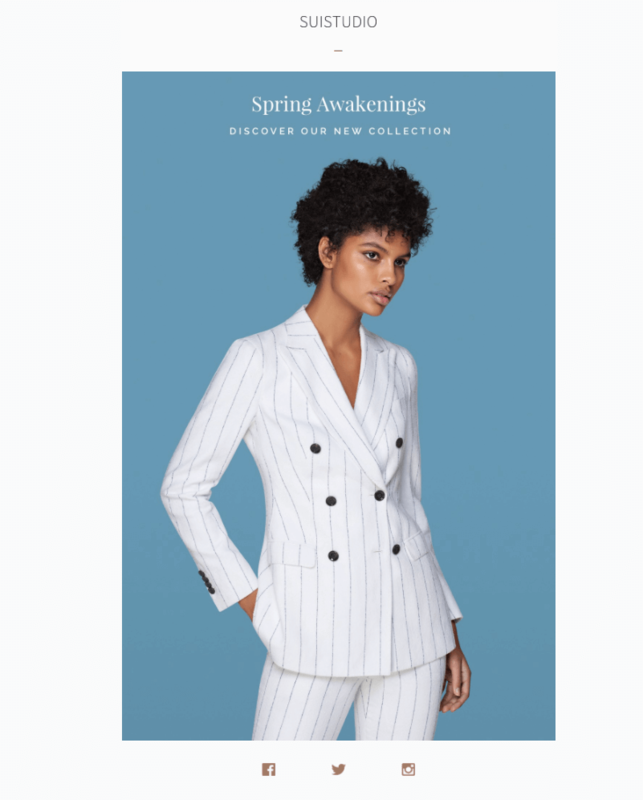 Our inbox is flush with spring emails, and there’s a lot to love. For one thing: color! The spring emails we’re receiving are bright, fresh, and fun. So, to celebrate the warmer weather and the rainbow of color in our inbox, this post will be organized by email color—from pink to yellow to green and more—so scroll on! There’s nothing exactly new about millennial pink. But its appeal certainly has staying power. And with the change in season, it seems that spring means all things pink. We’re seeing pink content, pink backgrounds, pink text, pink pink pink! And we won’t complain. There’s a specific charm that comes along with this color, and we’re happy to see it stay. 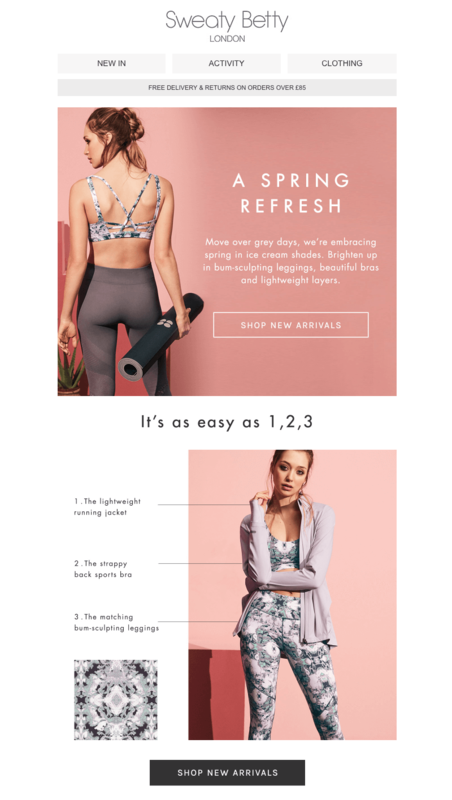 This perfectly pink email from Sweaty Betty isn’t particularly revolutionary, but we do love the well-crafted diagram in the second module. The simple labeling, coupled with a swatch of the clothing pattern, is visually delightful. In a sea of e-commerce emails, a simple touch like this stands out. 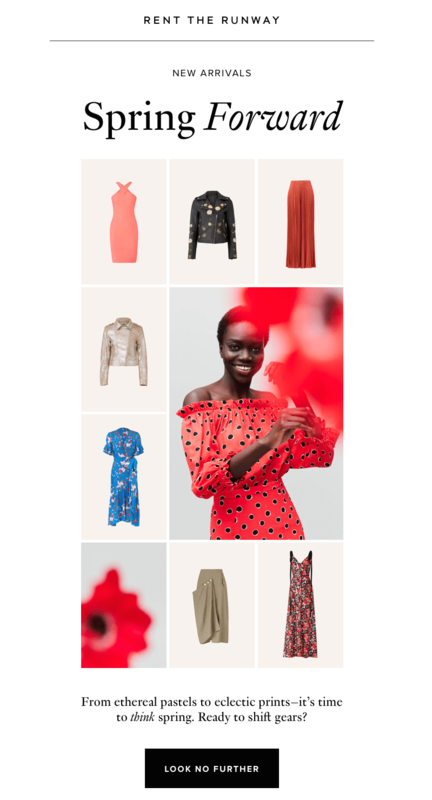 Rent the Runway typically uses a touch of blushy pink in emails, particularly as a background color. This email is no exception, with red and pink clothing on display. We love the blurry flower image in the bottom left, too. It plays off the airborne flower in the center image and polishes the design. A photo grid like this is easy to make and always looks sharp, especially when it’s responsive for smaller screens. Is there any color that says “happy” more than yellow? We think not! 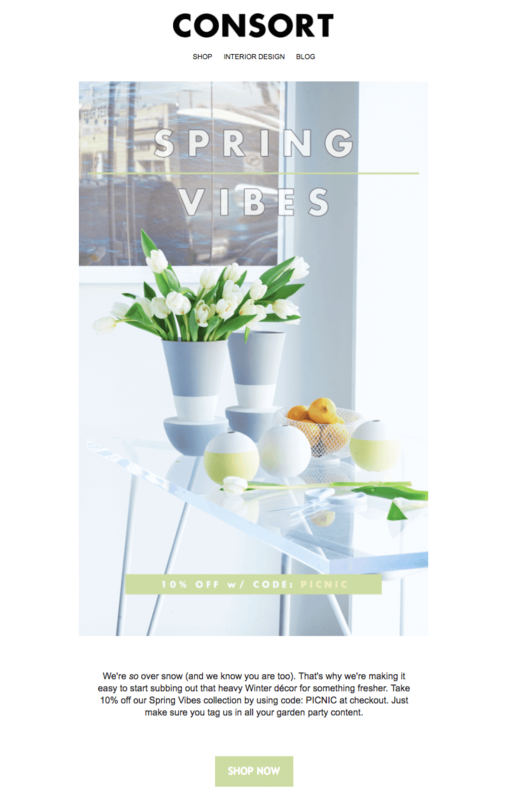 This peppy, cheerful color is perfect for spring, so it’s no wonder brands are embracing it. Splendid Spoon is a soup delivery and meal-planning service. This recent email introduces their garden minestrone soup—and its nutritional benefits—in a spunky, engaging way. Can’t you just imagine these veggies falling straight into a pot of simmering soup? Mmm! 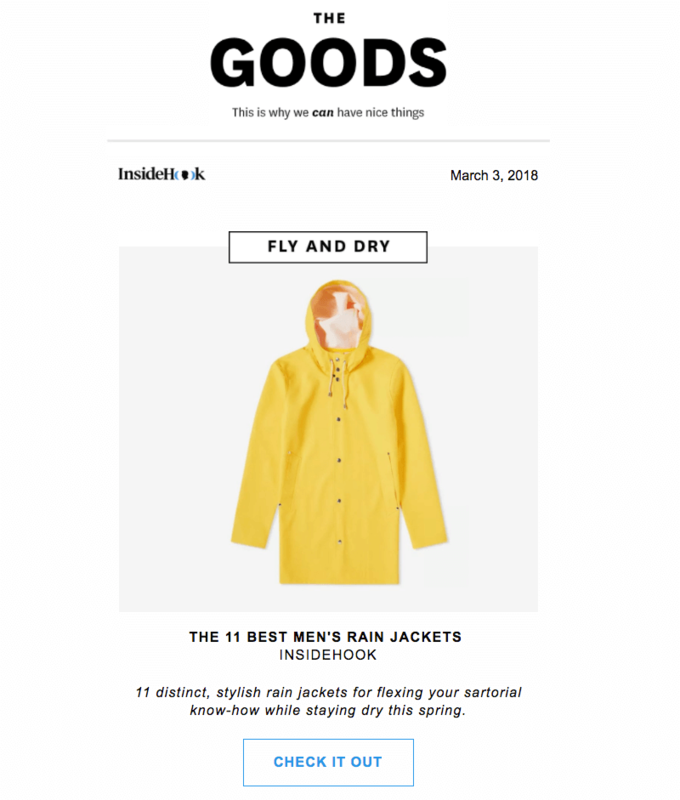 There’s nothing fancy about this email design, but that bright yellow background is just lovely. It’s so chipper, we can’t help but want to give it a click! This yellow rain jacket makes our heart sing! 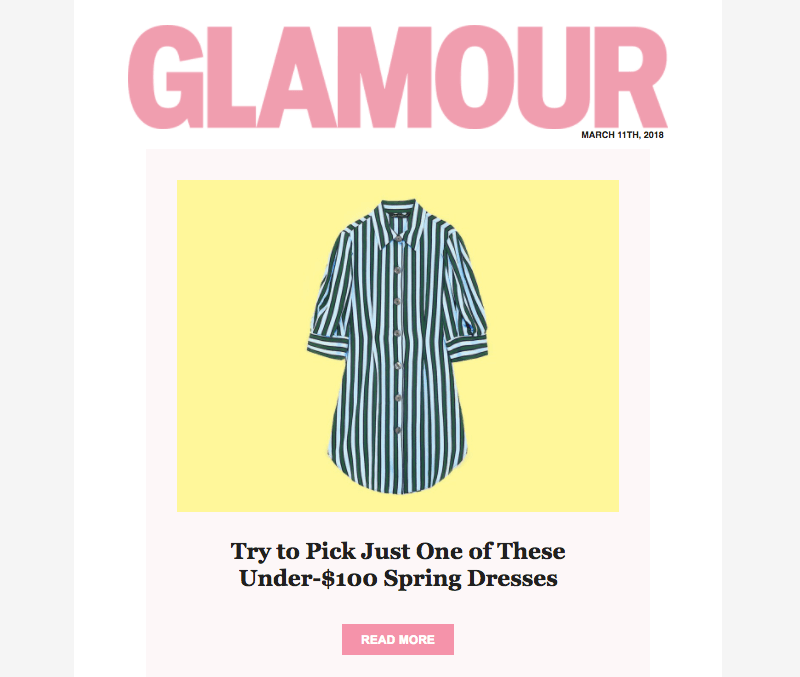 Similar to Glamour’s email, a single product takes the stage in the hero image position. Sometimes we want to get fancy with layered text, textures, illustrations, and so on, but these solo images show us that simple works, too. 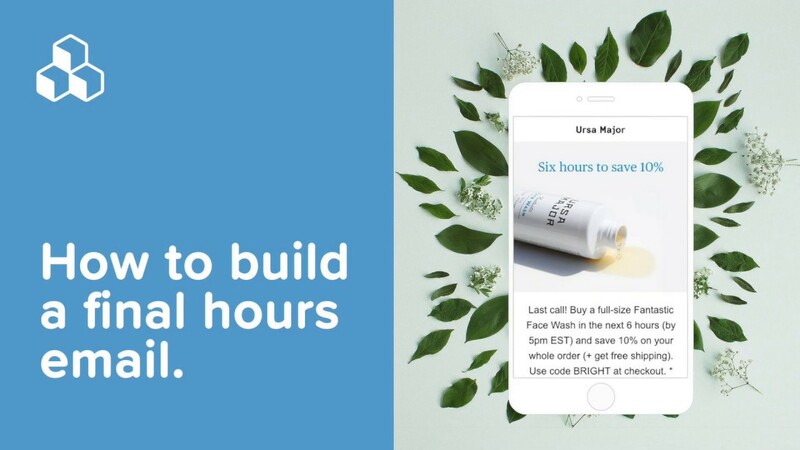 When you choose a single product and let it shine, readers might have a better idea of what they’re getting when they click, and there’s nothing wrong with that. After a long winter, there’s nothing like seeing the world erupt in green: green grass and buds and leaves and blossoms. Green is the color of growth. It’s refreshing. And, it’s very spring. The horizontal green line/divider in this email from Consort complements the green colors in the photo. So does that discount bar across the bottom. Both are placed carefully in the “dead space” at the top and bottom of the image. Well done! But, that bar could have included live text, so nothing looks blurry or fails to load? 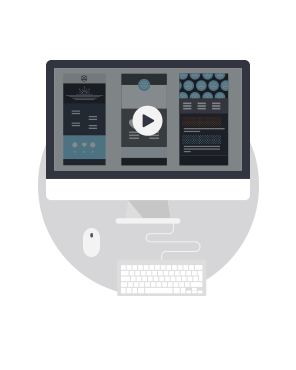 One of our favorite BEE editor features is the ability to place live text and CTA buttons on top of background images. 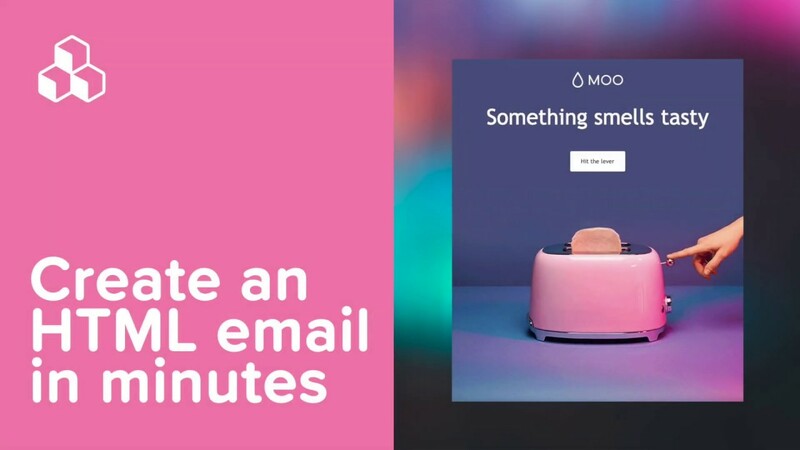 Catch the email background tutorial. Subject: New Keds are here! Check out this springtime color palette from Rifle Paper Co.! This email is a work of art. We love the off-center images, the layered illustrations, and how pops of millennial pink complement all that green. Clear blue skies, blue coastal scenes—we’re ready for ’em! Bring on the turquoise, teal, azure, and cyan! 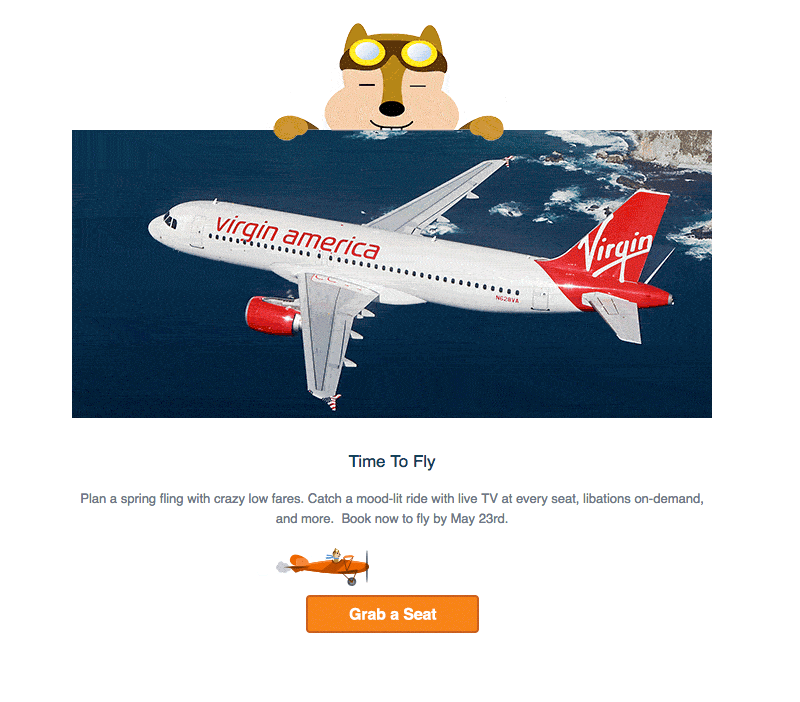 Subject: Time to fly with crazy low fares from $49 one way on Virgin America. That little airplane is animated too! It zooms around the button. We’re into it, Hipmunk! Oh, how this white suit pops against that ethereal blue background!! 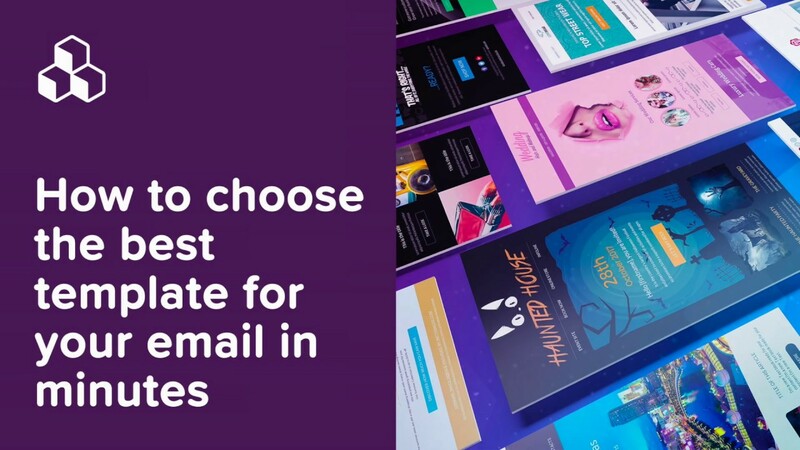 With a statement image so bold and beautiful, this email doesn’t need anything more. Except maybe a bulletproof CTA button, just to be sure. We love the playful copy in this email from Suit Supply. It was sent in early March, just when we were all really yearning for spring but snow was still in the forecast. At least the beautiful blues in this email offers some seasonal soothing. 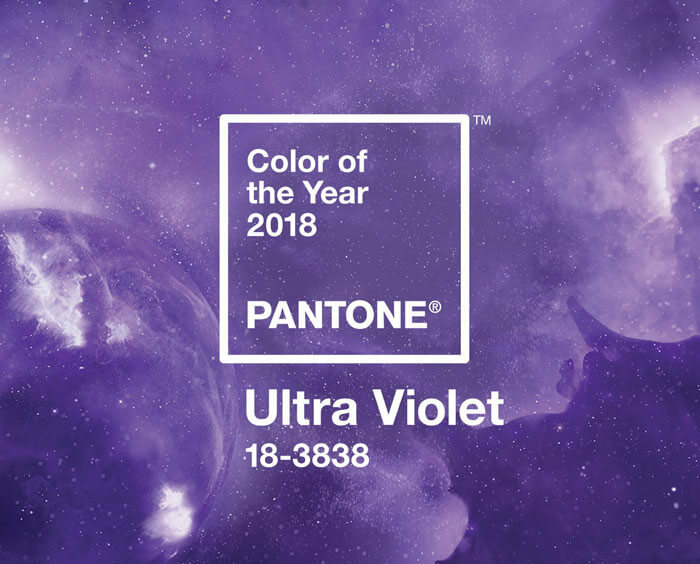 Did you know 2018’s Pantone color of the year is ultraviolet? Reformation knows how to let its images shine. We love how the brand alternates between landscape and horizontal orientations with spare text here and there. The layout offers a fresh, spring-y vibe. We actually found a few more violet emails, but keep an eye out for our Easter roundup to see them all! 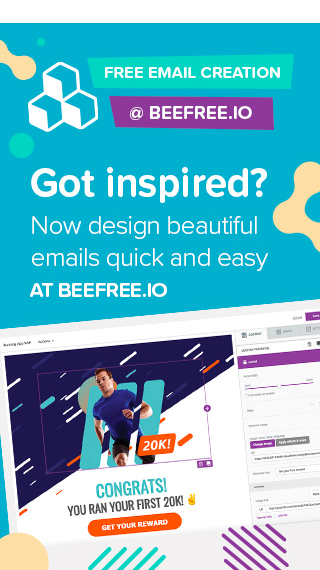 In the meantime, if you’re ready to start designing your own beautiful spring email, try a free BEE Pro trial. 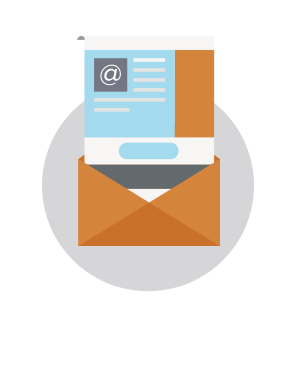 No HTML knowledge is required, and your email will even be mobile responsive!